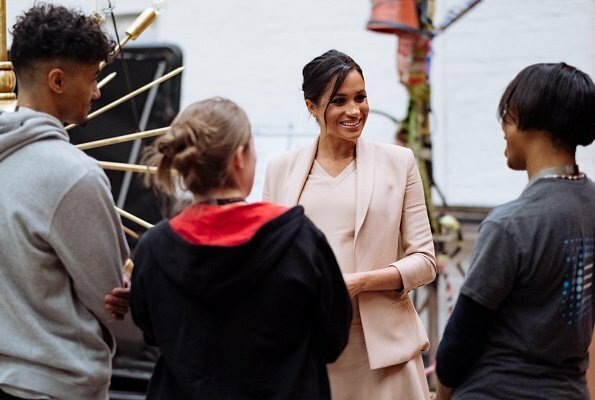 During that visit, The Duchess of Sussex received further information about the National Theatre's work with arts and community organisations across the UK. 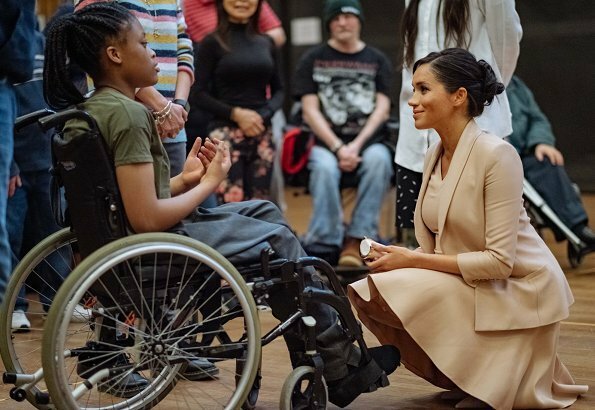 The Duchess attended a performance at National Theatre inspired by War Horse by schoolchildren from Edith Neville Primary School in Camden. That performance was created to mark the centenary of Armistice Day. She looks very good. One of the best outlooks ever. Also nice hair and make-up. That's a great maternity outfit! She looked lovely, just needed to add visible jewellery. I won't say anything about her lack of pantihose, she clearly doesn't care. But I do wonder how she is walking around in "summery" oufits in the middle of winter. Oh and I like her updo. There is nothing to care about where pantyhose are concerned. She does not have to wear them. It is a personal choice. Look up "air stockings". They are liquid or spray on coverage for legs. Gaining popularity over constricting nylon hose, which can be very uncomfortable for pregnant wome. Some articles say this is what Meghan is wearing as they also give legs a pretty sheen. @ Sarah , Meghan is not "walking around", just from the car to the building, short distance . Great look yes, she can of course pick up what she wants from her dressing room, but I don't understand why such summer clothing is appealing to her. I know the story expecting mothers have their "heat thermostat" disturbed, I remember about that but still not really understandable to me. Some nice boots would fit perfectly with the dress. Truly love this outfit, so clean and fresh, the flair of the dress balances the belly very well, and the shoes are to die for. Sarah, I don't see this outfit as summery, the fabric seems to be substantial, and cream color, as well as winter white, grey or pastels have been worn by every royal in the dead of winter, The Queen is fond of wearing bright colors, that could be considered spring/summer ( by some) almost year round. Hi Cherry Blossom, i wasn't talking about the colour, I love the colour. It's the fabric, it looks very light to me and she is not wearing any tights. Isn't she cold? I've never been pregnant so I wouldn't know about being so hot that one wouldn't be able to wear warm clothes in winter. Also before the Duchess was pregnant, when she had engagements with Prince Harry she wouldn't wear tights....so i am wondering if it's a pregnancy thing? I agree the Queen wears bright colours often, but she is always warmly dressed. It's a very pretty outfit, that I hope we will see more of in the future. I'm noticing that wrt dresses and gowns, the term "maternity wear" has become obsolete. 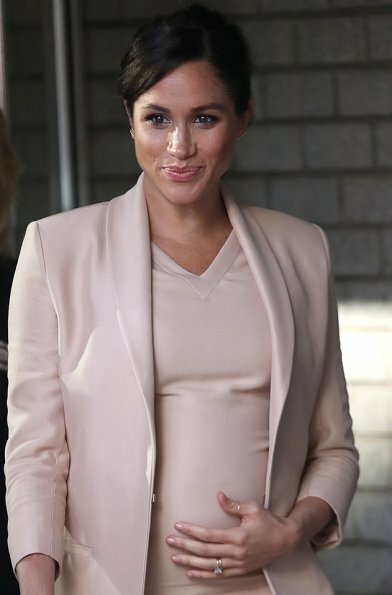 Most of the things Meghan has been wearing look like ordinary dresses that have a bit of stretch in the fabric. No longer any need to change sartorial gears when baby is onboard. Meghan looks beautiful. From her hair to her dress and jacket to her shoes, perfection. Mary B., you are not the only one in this Appreciation Society! 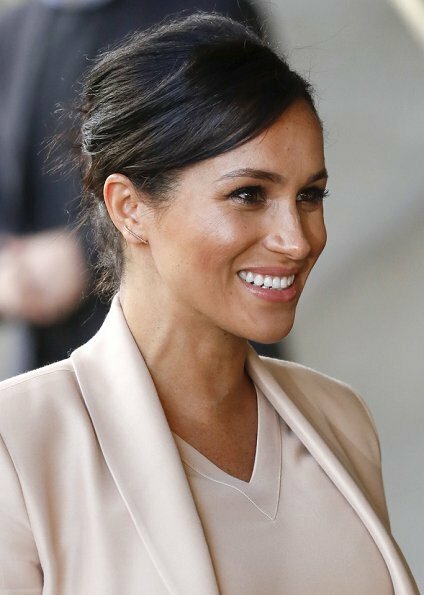 Meghan looks very good with this well-groomed hairstyle and this elegant dress. But the shoes? No! She looks well and happy. The outfit is nice, great colour, great shoes. But I really can't see this hundreds-of-times-belly holding any more. I work with pregnant women every working day but non of them behave like that. In my eyes it's unfair, because it takes a lot of attention from the people and organisations that she visits. To much Hollywood in my eyes. And there we go with the judgments... have you thought that the photographers take hundreds of shots, but publish the ones that will start the talking. In my humble opinion most of us don't get distracted from an event because a woman is not wearing stockings, seriously. My attention could be deviated if a public person, was rude, cold, inattentive or had poor higiene, but this isn't the case. How in the world is that "Hollywood"? Your definition of Hollywood is very bizarre. Your ideas come from gossip sites, not real life. Cherry Blossom is correct. Those photos are sold to gossip sites. I have no doubt that they get more money for any picture with her touching her bump because it creates a stir. This is not one gesture in hundred pics from different angles, it's, when you look on other sites who generally show more pics of the occasions, a lot of pictures with a lot of gestures like that. And look at the video, seen for example on dailymail, how she's doing it, than you see, what I mean with Hollywood, it's that way to much posing for attention on her person. I agree with you and still think it should be possible for everyone to express their opinion here. Gorgeous- love the outfit especially the pearly dusty pink colour and the beautifully cut jacket. She's looking well. Wel heel zomers en de prinsessen houden zich nog altijd aan die hoge hakken. Kousen heeft ze niet nodig, met haar bruine benen maar wel voor de koude. Air stockings is idiotic invention .Surely silk stockings look more elegant than greasy legs. Diana rarely wore stockings/tights and there was no issue there because there's no rule against it. If it doesn't bother the Queen, who hasn't stopped her from going without tights, than why should it bother you? I don't think she has what you are calling air stockings. She doesn't need them. Her legs are nice on their own. Hose are not in style, and it is her choice if she wears them or not. There are no rules about this, although this keeps coming up over and over again. Of course her legs do not look greasy--that is just a mean-spirited comment. How difficult is it to understand that there are NO RULES about wearing stockings? As several posters have intelligently noted, including neon snow, Diana dispensed with them over 30 years ago. Also, where did anyone get the idea that everyone feels temperature in the same way? It's quite small minded to think this way. Would a woman who spent a happy 4 years at Northwestern University and then several more happy years in Toronto, Canada wear a winter coat to step a few feet from a car into a heated building? Please look up the winter temperatures in these places. London just isn't that cold. 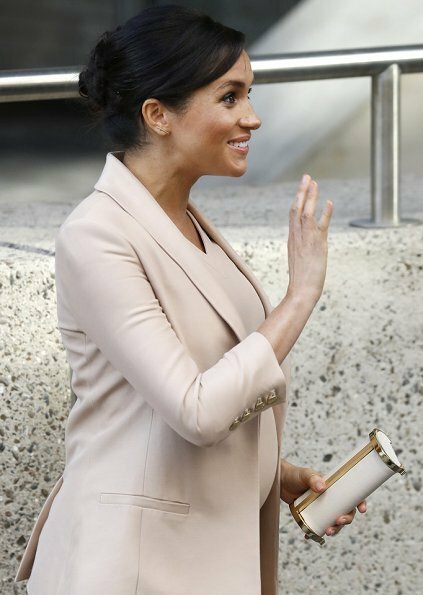 Meghan wears light color clothes in winter and dark clothes in summer. Normally it is vice versa for other people. Yoga, she's done it for ages. She has strong core muscles. @ Neon Snow, obviously you never were pregnant . Years of yoga work wonders. 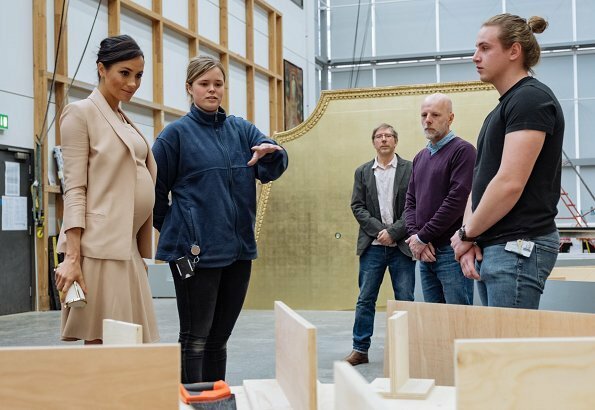 It is nice little dress and jacket and Meghan would look nice in that outfit but after having a baby. Nothing special about this dress. It looks like she is bored and trying her best for the moment. I'm guessing you don't spend a lot of time around people are actually bored. I agree Anonymous, all the royal ladies( not just the BRF all the other Royals ) wear tights even when heavily pregnant. I just don't get the purpose of air stockings. The stupid negative reporting from the rubbish media won't stop if she continues doing her own thing. I've loved everything she has worn in 2019, except the oufit she wore at the dog charity. However I am confused as to why she is not wearing tights or dressed warmly. I love love the outfit she is wearing today, even though she is "wearing" her air stockings again. She looks so chic!